Crippled Children’s Foundation provides funds to fulfill medical needs for children, whose needs would otherwise be unmet. We wish to make a difference in the medical care and medical opportunities for our children and young adults. The Crippled Children’s Clinic was formed in 1929 to treat polio. Children came from around the state, hundreds more than anticipated- and none were turned away. In the worst economic conditions in history, Birmingham opened its heart and its pocketbook to those less fortunate. Initial plans were to treat about 25 children but by January 1930 more than 100 applications for children needing treatment were on file at the clinic. As the patient load grew, contributions miraculously kept pace with the increasing needs of the clinic. And more uncommon approaches to fund-raising were pressed into service. In 1939, Mr. Zipp Newman, Sports Editor of the Birmingham News, led a group in organizing a college football review club with the purpose of financial support for the Crippled Children’s Clinic. Thus, the charitable organization created the Monday Morning Quarterback Club. The club’s primary purpose from creation has been support of children’s medical needs with the adjunct attraction of enjoying colllege football. This partnership exists to this day and is stronger and more successful than ever. In 1943, the first annual All-Star High School Football Game was sponsored by the Quarterback Club to benefit the Crippled Children’s Clinic. From that first game $40,011.19 went to the Crippled Children’s Clinic. As the years rolled by, the total contributions generated by the game grew. Soon the clinic began to outgrow its facilities, and a new larger dream hospital was waiting in the wings to become a reality. The magnificent hospital “that football built” opened in September 1951. The Quarterback Club and others had raised over three million dollars to build a six-story, fully equipped facility called the Crippled Children’s Clinic and Hospital. The story of the Crippled Children’s Hospital came to a happy ending in 1969 when Drs. Salk and Sabin developed a vaccine against polio in 1954. With polio mercifully eradicated, the hospital closed its doors, and the building was sold to the University of Alabama Medical Center. While the story of the Crippled Children’s Hospital ended, the story of the Crippled Children’s Foundation was just beginning. 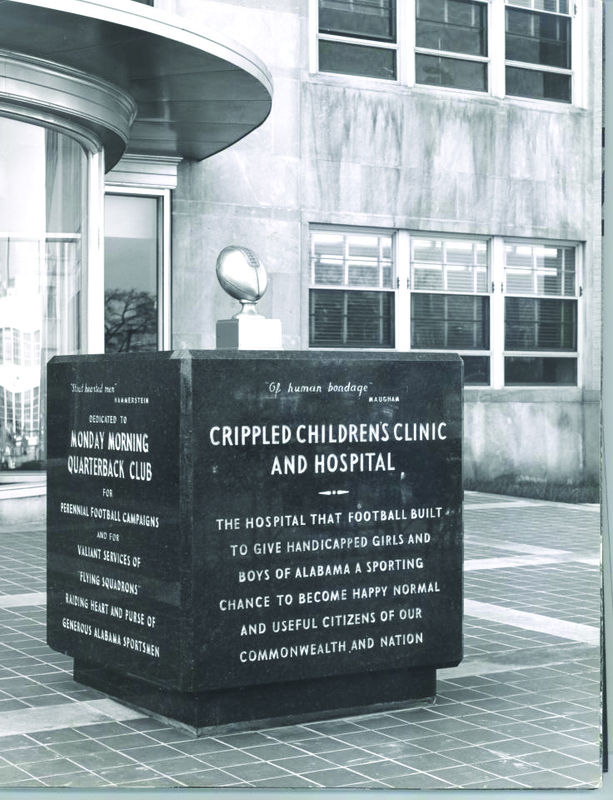 Money from the sale of the Crippled Children’s Hospital was placed in a fund to benefit children throughout Alabama by defraying medical expenses. The Monday Morning Quarterback Club and the Crippled Children’s Foundation continue their dedication to the well-being of children. Both organizations have an ongoing commitment to care for the needs of our state’s greatest natural resource. Because of these joint efforts, the Foundation has contributed more than $22 million dollars to various charitable projects over the years. 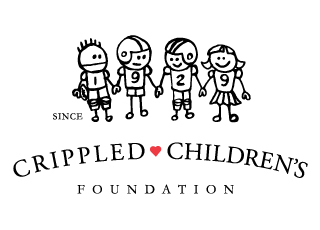 The Crippled Children’s Foundation provided children’s medical charities $1,450,000 in 2016.